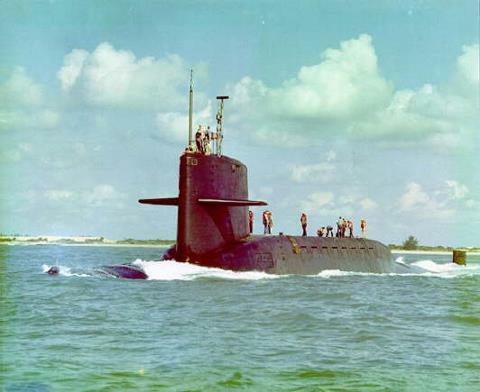 As I look back over the past forty five years, I keep wondering what it was about serving on submarines was the part of my life that had the most impact on my life. As I look around social media, it’s not too hard to see that I am not alone in that view. Don’t get me wrong. My marriage to Debbie and my parents were impactful and meaningful in many ways that transcend the service, but no other single thing has been as much of a driver as those days on board the boats I was a crew member of. You can get a little tunnel vision looking back across all of those years and forget there were bad things. Not enough sleep, separation from the family and real world, stress that was off the charts surrounded by unbelievable boredom and sleeping on a foam mattress in a space the size of a coffin (if you were lucky). But there are the good memories that seem to overshadow most of those. When you are young and new to the game, it’s getting a signature on your qualification card. Not just an easy one but one of the really complicated ones that require an inordinate amount of knowledge and skill. With each succeeding signature, you come closer and closer to that goal. Not just the physical symbol of the dolphins, but knowing that you will be seen as a fully qualified member of the crew. The current trend for many millennials is something called person branding. Personal branding is the practice of people marketing themselves and their careers as brands. While previous self-help management techniques were about self-improvement, the personal-branding concept suggests instead that success comes from self-packaging. Tom Peters, a management Guru, is thought to have been the first to use and discuss this concept in a 1997 article. Personal branding is the ongoing process of establishing a prescribed image or impression in the mind of others about an individual, group, or organization. 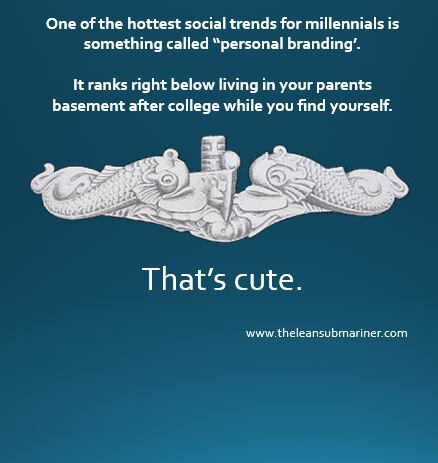 Being a submariner has always been about personal branding but in a bigger way. The focus as you qualify is very inward. You are trying your best to learn the knowledge and become an expert in the skills that make a good submariner. From damage control to operating the ship’s systems, you must be able to contribute in every sense of the need when the ship is operating or when it is involved in a casualty (real of practice). And everyone on board is a member of the combat and casualty teams. You might be a phone talker or you might be the nozzle man on the hose preparing to fight the infamous deep fat fryer fire but you will play some role. 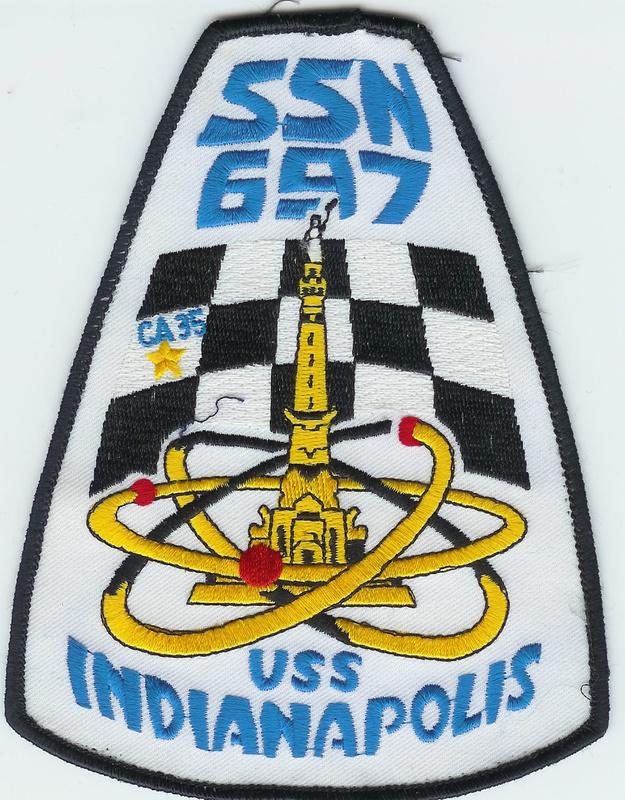 My first experience on an aircraft carrier as a Chief (I was teaching classes while the Nimitz was underway) was a real eye opener. A drill was announced over the PA system and I was trying to rush to my battle station. What stunned me is that not everyone was moving at the speed of light to get to where they should have been. Only designated “Flying Squads” of DC men were in motion. 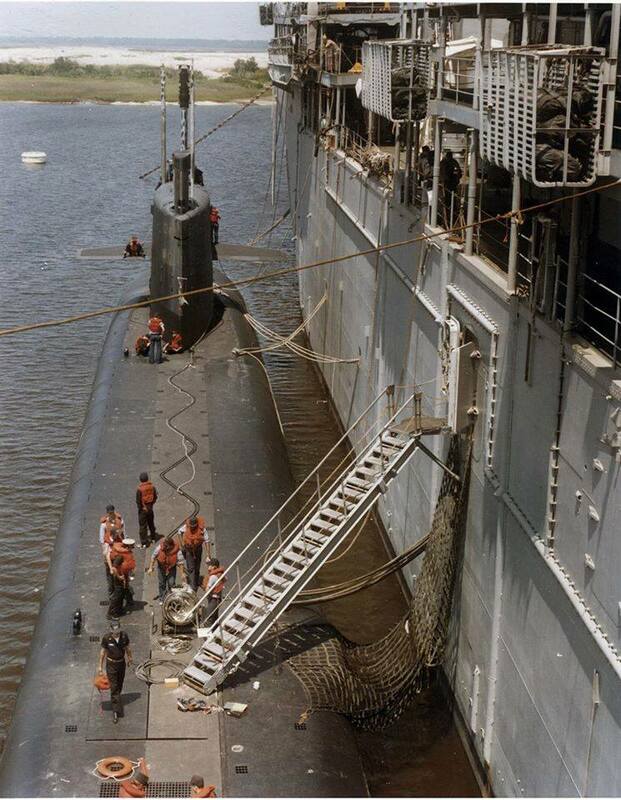 I cannot even imagine that happening on any submarine I ever served on. But the inward focus gives way to a crew focus once you qualify as a submariner. You have about five minutes to gloat that you have achieved something many never do or could do. Then you start to focus on actually learning how your role is part of the crew’s success. You qualify increasingly more complicated roles on the boat and you learn that you are now expected to train the ones that will come behind you. It is stunning when I look back how quickly the transition from non-qual to subject matter expert comes. Not because you are that amazing of a person but out of necessity. The first time I found myself “in charge” was when I learned what real challenges are. Even on submarines, there is a small team for nearly every task (with the exception of the Corpsman and sometimes the Ship’s Yeoman). All of the other divisions have work related to their equipment and division’s responsibility. Each of those divisions need leaders and when you suddenly find yourself in charge on that special day, you pray that your training and the coaching you have received will be enough. The branding for a submarine is twofold. You want to come back to the surface every time you dive and if you have any pride at all, you want your boat to be known and remembered as being the best. To be the best, you must first outperform the enemies abilities but you must also consistently rise to the top among a group of submariners that already think they are the best crews; your Squadron Mates. To get there, you drill. Drills mean getting more proficient and better able to manage the unlimited challenges presented by operating in the ocean’s depths. All of that means sacrifice. Since there is no place to hide, sleep deprivation and personal sacrifices become common place. Tempers can often flare and we are often pushed to the limit. But the ship’s that drill the hardest are the ones who are rewarded with the recognition of external teams and the personal satisfaction of knowing you can take almost anything the ocean can throw at you. All of this binds you together as a crew. The longer you serve on a boat, the more your personal brand is overshadowed by the brand of the boat. If you are really lucky, this will last for the rest of your life. I have been away from the Navy and submarines now for many years. But I still proudly display my dolphins as the single greatest achievement of my career. More than my rank, more than my awards, more than the letters and medals that came from those days. I will always be glad that when my nation needed me, I was lucky enough to volunteer twice and serve with the greatest crews I could have ever asked for. 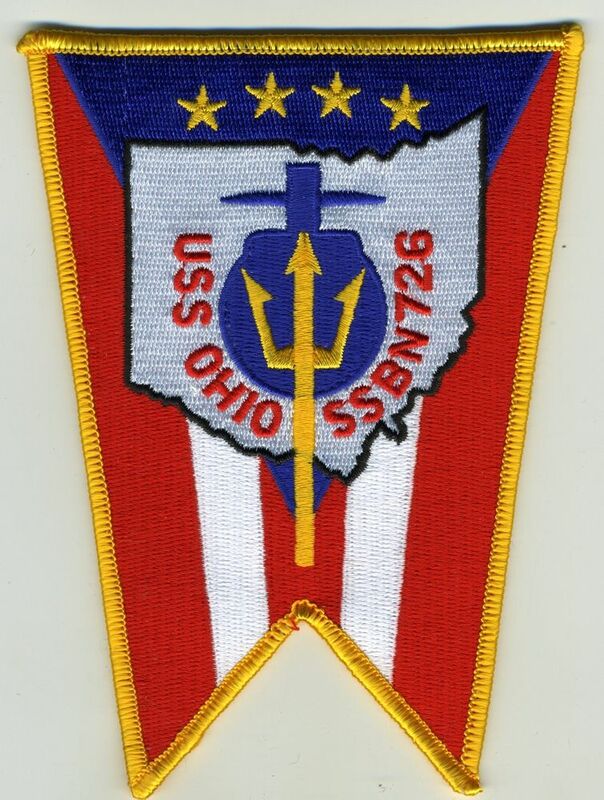 That certainly includes my non-submarine crews but I am eternally grateful to have earned my fish. Proud – As you should be. I have always stated that submariners are a special breed and I still adhere to that! Mister Mac, you’ve hit another home run. Trying to put into words how I feel about my service and the dolphins I still have (and wear with my USO-NC ‘uniform’) is often difficult (especially to those who have never been there). Thanks again. Yes, I was proud to earn my dolphins. I earned them during my 1st patrol and that made them extra special to me. My experiences on the boat differ slightly from Mr. Mac. In the tenth paragraph Mister Mac says that “tempers can often flare”. I don’t remember it that way at all. 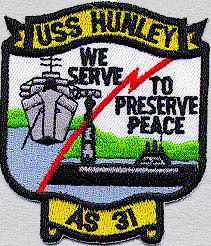 I made eight patrols and never had a heated argument with a shipmate. The most frustration I saw with the crew was the frustration with BS drills. Yes, some of them were BS. The worst BS drill I ever experienced was someone from the tender attempting to get by the topside watch with a picture of Micky Mouse on his ID card. Maybe it was just me but I found drills like that to be demoralizing. So much so, they would crush a hardworking spirit to the point that you didn’t care as much as you should. Also, I never felt like I was competing with other boats in the squadron. Maybe the Captain felt that way but that was not a normal conversation of the crew. Also, and most of all I never feared coming back to the surface after a dive. It never even crossed my mind. Some may say that was because I was young and young people don’t think of death but I always knew we would return to the surface because I believed in the strength and ability of the boat and crew. I just hated that it took so darn long. Gotta agree with Mike. I don’t recall any temper related incident ever getting close to the boiling point. Not even a controlled simmer. Oh, we had very intense discussions but I would venture to submit they were educational in their resolve. 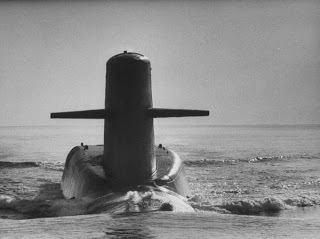 There were only two Submariners that most would steer clear of on any of the boats I served in. One was a Chief Electrician who knew everything about anything and cheated at cards. We came back off a run and his wife had left him. He was real sour grapes and got off the boat almost before we took on shore power. But not before telling the cook again, how to slice horsecock! Never heard from or about him ever again and I don’t think anyone cared enough to do a follow-up. The other was a passed over for command XO who actually did get transferred to a pitiful place like Adak or Greenland. He and the COB planned a ships party and no one showed up, not even the Chief of the Boat. I am happy that you did not have those experiences. I am looking back through the lenses of almost forty five years and many other experiences when I write my stories. I can only count for my own experience and let others have their own memories. The 598 was an interesting boat by the time I got on board. It had been through some pretty rough patches after the Charleston overhaul and there were many instances where equipment malfunctions affected peoples attitudes. The other issues that raised tempers was the involuntary extension on patrols when the relieving boat was unable to relieve. When the cigarettes started running out and the food got very repetitious, tempers often got short. But as I said, each person has their own memories. Of the 800 people who have viewed this story so far, not many have taken the time to write about their own experiences which may be different. But having served on five different boats, I am aware that not all rides are the same. Thanks for the feedback. Next"…the Italian Navigator has just landed in the New World…"